Yep its my fathers birthday today. I really wish I had more memories of him. I wish we had a chance to get to know each other. I wish I could have gotten his advice for hundreds if not thousands of questions. I wish I had you to tell me to have confidence in myself. I wish I had you to tell me to stop playing the fool several times in my life. I wish I had the chance to learn to be a better father myself, from you. I wish my children could have called you grandpa and you would have heard those words. Its been over 5 decades now since his passing. I can still see him on that last day. I guess some things you just don’t get out of your mind, ever. I wish the most indelible memory was something else than the trauma of finding him passing and the military funeral at Arlington that followed. I do have a few warm ones but more troubling ones by far. I find myself often thinking that I hope he has been proud of me. I wonder how my life would have been different with him. I guess that is kind of a natural thing to wonder what might have been. 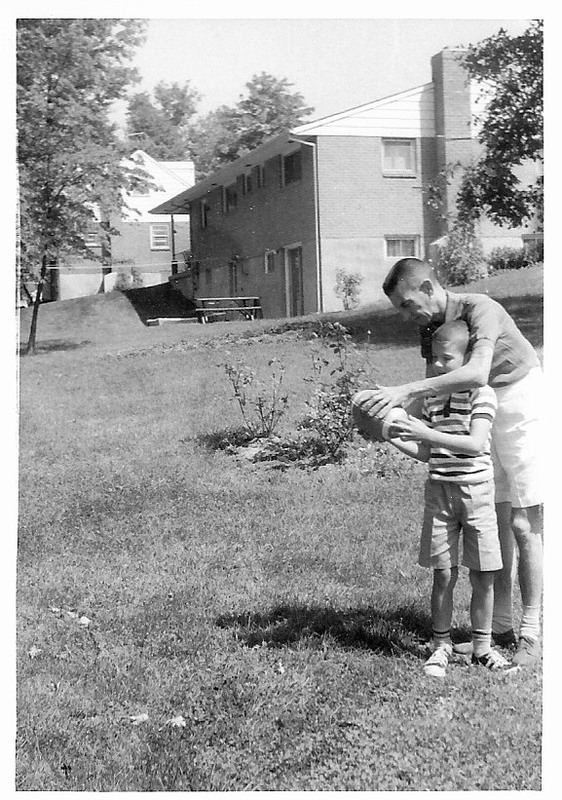 Dad showing me the proper grip on a football. Please don’t get me wrong. My Mom stepped up big time and raised us very well taking on both roles as best she could. And with a son (me) who rebelled and was a pain in the behind it certainly wasn’t easy. I regret to this day causing her concern or worry. I’ve got to get back to learning more about my father. He served in two wars and went to both the Arctic and Antarctic multiple time on US Navy expeditions. I still have a copy of a cold weather medical manual he helped write. I’m sure there are some other treasures I haven’t pulled out yet. It’s hard to go though those things and wonderful at the same time. The photo here is one that was taken a few weeks before he passed. Its one of the positive memories. I hope he is proud of me, at least for the few good qualities I’ve picked up along the way in life. Happy Birthday Dad. I’m sorry I’ve been slack on posting lately. Just haven’t been feeling 100% most days. Pain makes it hard to hold focus at times. I’m dreading some test I have to get done. I’m encouraged that I’ll see my friends and family very soon again this week and that is lifting my spirits.